The Blakiston's Fish-Owl is the largest owl in the world. Compared with North America’s largest familiar owl, the Great Horned, the Blakiston's is six inches taller and nearly three times as heavy. No other owl approaches its prodigious girth. 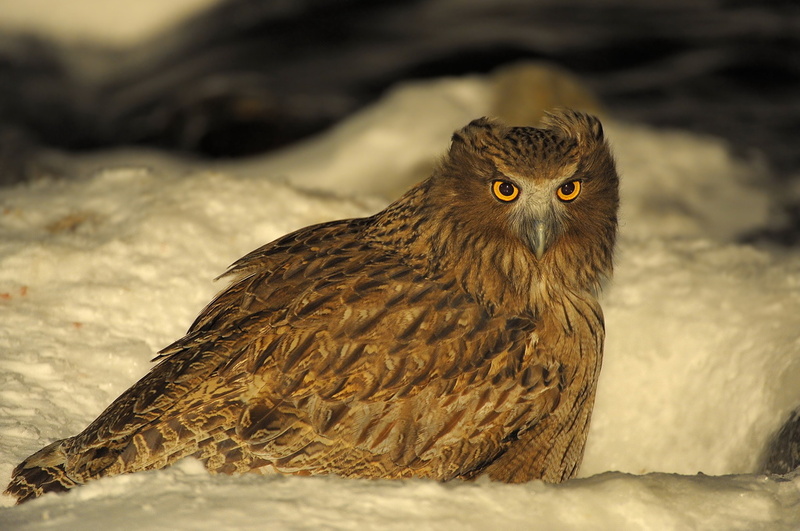 But the Blakiston's Fish-Owl is endangered. It's found only in wooded areas in the east of Japan's second-largest island, Hokkaido, and in small areas in adjacent Russia and China. Preservation of forest and river habitats in these regions will be crucial to the survival of this one-of-a-kind owl. It's Blakiston’s Fish-Owl. Blakiston’s, because its existence was recorded by the English naturalist, Thomas Blakiston. And Fish-Owl, because ... it hunts fish. Standing at the edge of a stream, sometimes in the shallows, it watches intently. Eyes fixed on the water. Then, with a sudden jump forward, wings upraised, it plunges its talons into a fish and pulls it onto the bank — sometimes, a fish as large as a salmon. This massive bird is the largest owl in the world. Tawny brown, a female Blakiston’s Fish-Owl is the larger of the sexes and may stand 28 inches tall, weighing in at over ten pounds. That's the same weight as a Bald Eagle. Compared with our largest familiar owl, the Great Horned, the Blakiston's is six inches taller and nearly three times as heavy. No other owl approaches its prodigious girth. But the Blakiston's Fish-Owl is endangered. It's found only in wooded areas in the east of Japan's second-largest island, Hokkaido, and in small areas in adjacent Russia and China.